William Marcy Barnhouse was born in 1856 in Fayette County, PA, the son of Harrison and Catherine (Minerd) Barnhouse. Tragically, he died at age 18, the same year as his father. William lived with his parents in East Liberty (Dickerson Run), near Vanderbilt, Fayette County, PA. He was a popular member of the Sunday School class of the East Liberty Presbyterian Church and today is memorialized on the church's website. On Aug. 11, 1874, at the age of 18, William passed away. The cause is, unfortunately, unknown. In mourning, the Secretary of the Sunday School wrote a five-paragraph "Resolution of Respect that was published in the Uniontown Genius of Liberty. The resolution stated that he was " our brother, ... a loving friend, a diligent and respectful member of the school, and a warm-hearted Christian of bright promise for future usefulness and honor." The sympathies also extended to "the bereaved family the warmest sympathy of our hearts, and that we hereby pledge them our prayers that they may lovingly and meekly bear their present affliction." In closing, the resolution ordered that "we drape the rostrum of the school room in mourning for thirty days." The following month, the Genius reported that "We are pleased to learn that many friends and acquaintances of Wm. 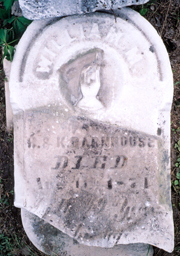 M. Barnhouse, deceased, are about purchasing a nice set of tomb stones for a memento." 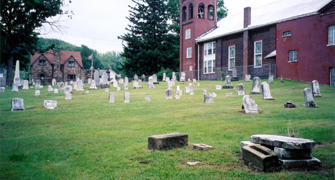 Circa 2001, William's broken grave marker stacked in the old churchyard in Dickerson Run. The marker was placed at his grave at the East Liberty church. Rediscovered in 2001, the marker is legible but broken, and lies flat in a stack of other broken grave markers, toward the back of the small fenced cemetery. Click here to visit a national Barnhouse family webpage, with broader information than just for those cousins belonging to our family. The news of William's death would have been especially agonizing to his married sister Clara Huston, who was living far away in Kansas. Whether she got back home for the burial is not known, although she did return by train the following month for their father's funeral. Clara paid lasting tribute to her dead brother when she named her newborn son after him in 1883 -- "Marcy Barnhouse Huston." Tragedy compounded upon heartache when the infant died at age three months in January 1884. The tender child's remains were laid to rest in Spring Hill Cemetery near Stanley, Kansas, and a small marker erected in his memory. The marker is seen here, as photographed in September 2010.